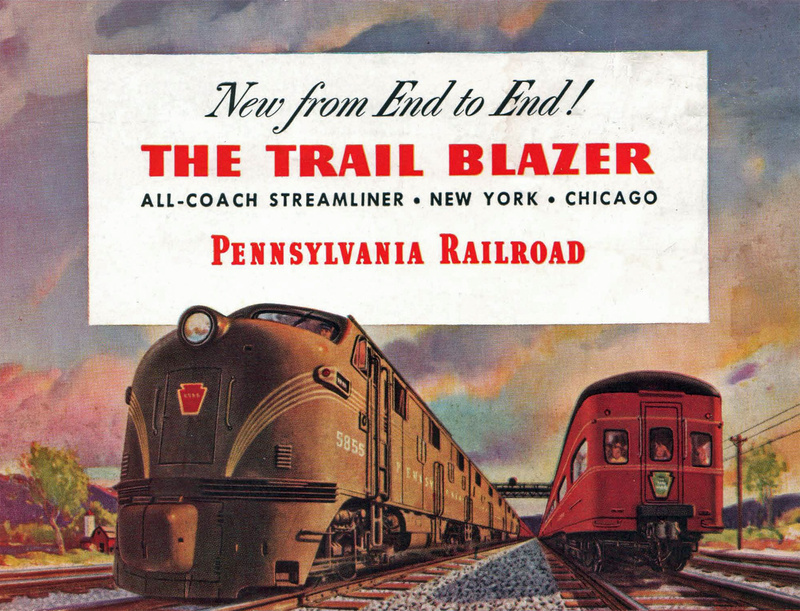 The Trail Blazer was once considered a top Pennsylvania train despite its coach-only status. It was first launched a year after the railroad unveiled its "Fleet Of Modernism" streamliners and tailored as a less-expensive alternative for those traveling between New York and Chicago. 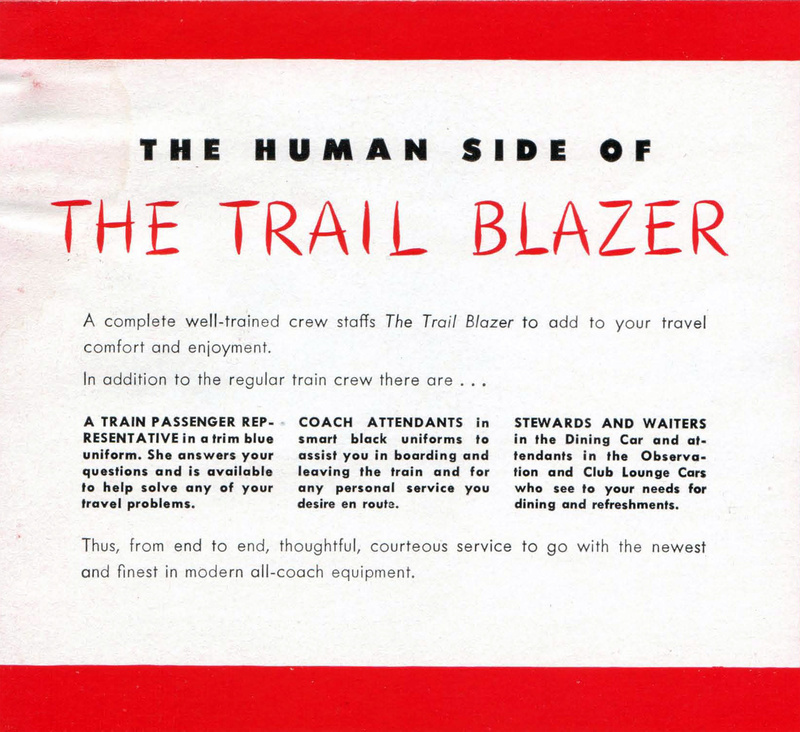 The Trail Blazer was heavily advertised in artwork and pamphlets along with other notables such as the Broadway Limited and General. Through World War II it sustained strong ridership but was hurt badly by the postwar decline in rail travel given its limited accommodations and the shear number of other trains the PRR dispatched over the route. By the 1950s it was slated for cancellation and what was once such a proud member of the fleet left the timetable before 1960. During June of 1938 the Pennsylvania Railroad kicked off its all-new streamlined passenger service; called the "Fleet Of Modernism" it comprised the Broadway (New York-Chicago), General (New York-Chicago), Spirit Of St. Louis (New York-St. Louis), and Liberty Limited (Washington-Chicago). However, as new equipment arrived or was rebuilt from older heavyweight cars during the next few years other new names appeared including the Trail Blazer. The train was christened on July 28, 1939 and supplemented the other top Blue Ribbon trains on the car by offering coach-only accommodations (by reservation only) on a fast, 17-hour schedule (similar to the Santa Fe's El Capitan that ran between Chicago and Los Angeles complementing the Super Chief). It was listed as trains #76, eastbound, and #77 westbound. 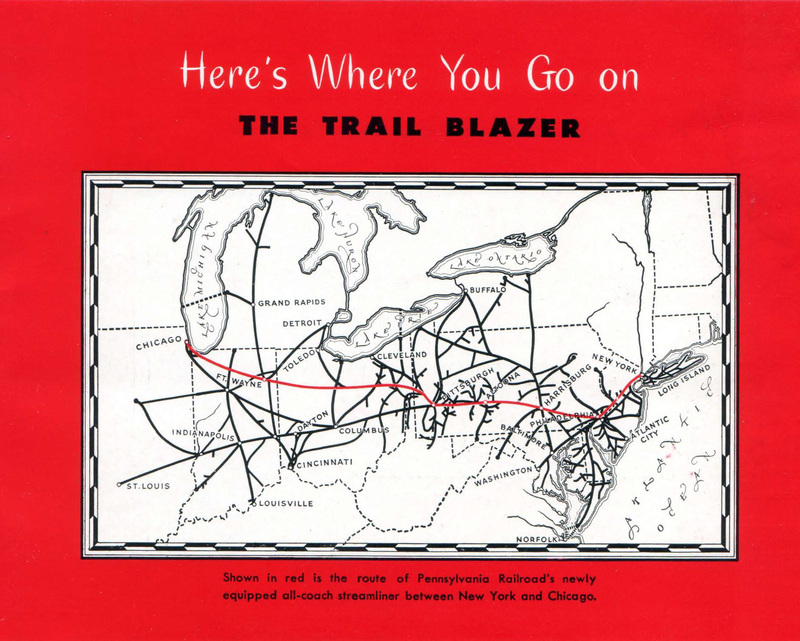 To showcase the service after World War II when it received new diesel power and lightweight cars Pennsylvania released a large, colorful brochure featuring all of the amenities the Trail Blazer had to offer. In the opening pages the train was described as follows: "Presenting the Trail Blazer, newly equipped, luxurious all-coach streamliner. 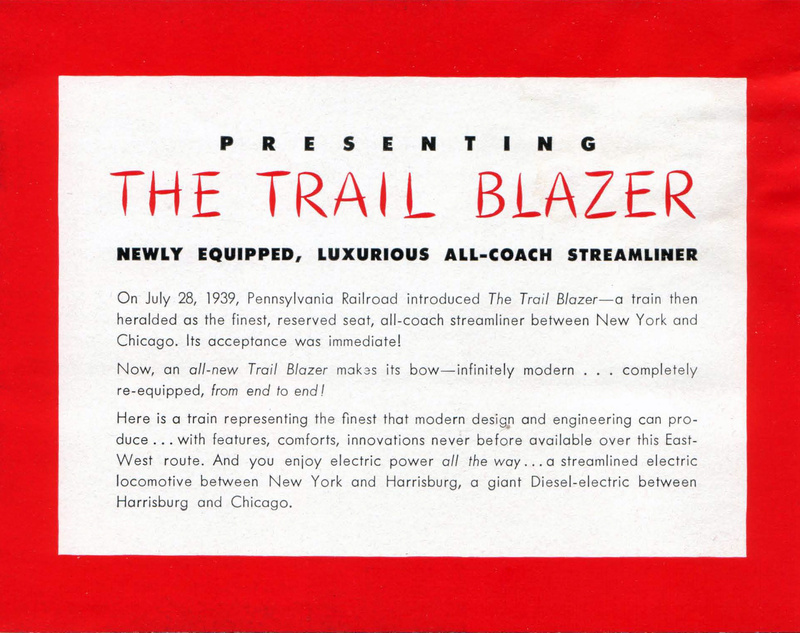 On July 28, 1939 Pennsylvania Railroad introduced the Trail Blazer - a train then heralded as the finest, reserved seat, all-coach streamliner between New York and Chicago. Its acceptance was immediate! Now, an all-new Trail Blazer marks its bow - infinitely modern...completely reequipped from end-to-end! Here is a train representing the finest that modern design and engineering can produce...with features, comforts, innovations never before available over this East-West route. And you enjoy electric power all the way...a streamlined electric locomotive between New York and Harrisburg, a giant diesel-electric between Harrisburg and Chicago." The booklet was produced in 1948, which sadly came only a few short years prior to the train receiving its first cutbacks. Prior to that time, particularly during the hectic and busy years of World War II the Trail Blazer saw strong patronage as the PRR had difficulty just meeting demand due to the wartime traffic rush. According to Harry Stegmaier, Jr.'s book, "Pennsylvania Railroad: Passenger Trains, Consists & Cars - 1952 Volume I," its typical consist included nearly all reclining seat coaches from the newer P85BR Class (up to nine per train) along with a twin unit diner/kitchen-dormitory, observation-buffet-lounge (home built at the Altoona Car Shops), baggage-lounge, and a standard baggage. While it may have been labeled as "coach only" the Trail Blazer provided first-class accommodations. Unfortunately, the sharp drop in ridership experienced after the war was felt quickly by a train like the Trail Blazer which, while a fine service, did not offer the level of amenities as others such as the Broadway, General, or Pennsylvania Limited and remaining patronage usually opted for these instead. In short, there were simply too many trains serving ever-shrinking demand in the New York - Chicago market. In 1950 the PRR combined the Trail Blazer with the General during the summer months and by 1952 this move had been permanent. However, between December 12th and January 20th during the holiday rush period that year it would return to the timetable regaining its westbound train number (77) while running as a section of the General eastbound. By 1953 this arrangement was ended and the Trail Blazer became simply a name-only on the schedule, combined with the General indefinitely from that time forward (trains #48 and #49). For the next few years the Pennsylvania continued running the name in print until July 26, 1959 when it quietly disappeared. Throughout that decade the PRR worked vigorously to cut the rising costs associated with its massive passenger fleet. It downsized its services in the New York - Chicago market from several, to only a few trains just before the Penn Central merger in early 1968. This included the General, whose name disappeared from the timetable in late 1967 (its former numbers were acquired by the Broadway).